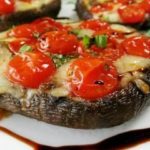 Caprese stuffed portobello mushrooms are a wonderful antipasto or side and pretty garnish or even a stand alone vegetable dish. Since the portabella mushroom is available all year round, why not take advantage of them for putting together simple dishes. If they are kept dry and refrigerate, they will keep for up to a week. Did you know that the more familiar little brown crimini mushroom is simply a young portabello. A brown crimini mushroom is a juvenile portobello. It is said to be Italian in origin and named after the town of Portobello, Sardenia, Italy. In Northern Italy portobello mushrooms are simply referred to as ‘cappellone’ meaning ‘big hat’. The Portabella mushroom is one of the most imposing mushrooms in size. It has a rounded, earthen tan flat cap with near black gills on its underside. Its stem is thick, white and edible. 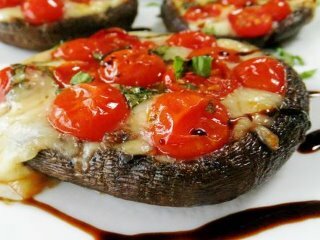 The Portabella mushroom has a very memorable, rich and meaty texture and flavor, which it retains even after cooking. Portabella mushrooms are rich and meaty in texture and flavour and very large which makes them extremely are versatile. This recipe serves 4 but can be used as a guide for serving more and adapted to create your own mushroom fillings. Brush each of the mushroom caps and rims with olive oil. Fill each of the mushrooms with the mozzarella, top that with the tomato halves, basil, salt and pepper. Bake in the centre of the oven for 15 – 20 minutes until the cheese melts and begins to brown. 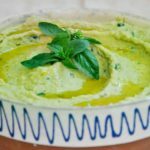 Serve with some crusty Italian bread.